EDIT 11/11/12: The winner has been announced! Light up the candles, and then promptly blow them all out because nail polish is flammable and you're not irresponsible...it's Nailed It's birthday! One year ago today, Nailed It was born. Since then, it has flourished and become an amazing experience for me and hopefully my readers! Earlier today there were 555,555 page views as well. I couldn't be happier with the direction this blog is going, and I owe so much of that to my readers! Thank you all so much! I wanted to celebrate this milestone and say thanks with my first nail art competition. I've opened up this competition to everyone everywhere, with a wonderful prize, sponsored by Born Pretty. The winner (chosen by me) will win a $20 gift certificate to Born Pretty, to spend on anything they like, including glitter, nail polish, nail art brushes, dotting tools, rhinestones, stamps and more. Damn. For this contest, your theme is two bottles of polish. You can only use two bottles of polish (notice that I didn't say "two colors" because that leaves room for interpretation). I want you to challenge yourself to create something spectacular with only two bottles of polish to work with. The rules of this are pretty simple. Any entries that do not meet the rules listed below will not be counted. You may only use two bottles of polish (a clear base coat and clear or matte top coat excluded). The design must be your own, done on your own fingernails (please no toes). You may not use stamps or nail art decorations in the final design. You may use tape to create clean lines, but the tape must be removed. Glitter polishes may be used if they are sold as a polish (no loose glitter). You must name the two bottles of polish used in your design. You may not use acrylic paint. You must submit the URL of your post using the inlinkz tool below. You may submit a post you have already published. You may enter until Friday, November 9 at noon (MST). This competition is open internationally to anyone qualified to order from the BornPrettyStore site. Please share this competition with your friends and readers of your own blog. If you have any additional questions about the competition, how to enter, or anything else, please feel free to comment or send me an email. Good luck to everyone, and a big thank you to Born Pretty for donating such a great prize! Click the Add Your Link button below to enter your submission. Entries submitted in the comments of this post will not be counted. Happy Blog Birthday =]! I'm totally excited about this contest...now, time to brainstorm =]! Oh man, I wish I hadn't just given in to temptation and cut my nails all the way off :( Oh well, I'm excited to see the entries! Please tell me you will put up a bunch of the good ones! Do base coats and top coats count? Good question! No they don't as long as they are both clear. Happy blog birthday! I hope it's possible to enter with loading my picture to flickr. I'm asking because you are talking about blog posts :) I'm already brainstorming!! You may certainly upload your picture through Flickr. Just make sure you include information about what the two bottles are. I'm looking forward to all the designs people will come up with ^_^ . Happy Blog Birthday! Great idea for the challenge! Yep! It's open internationally. For your final design, you may not use decorations. Just the two bottles of polish. Loved the challenge... I'll definitely think about something! Happy blog birthday!! And congrats on doing so well. I've never done a nail art competition, Sounds fun!! Thinking up ideas already!! Can we use dotting tools and such? Absolutely! You may use any tools you need to (except stamps) to create the final look. Just make sure that no nail art decorations or stamps are used. Thanks! And yes, it's open internationally. Oh another question: are you allowed to mix the two colors (I'd take a picture to prove it then, haha ;)) like you have to for gradient style or something like this? I might have an idea then. Absolutely! I was wondering if someone was going to be sneaky enough to mix colors. ;) Really, your only restrictions are two bottles, no nail art decorations, no stamps, and no acrylic paints. If you wind up with 15 different colors from two bottles, more power to you! Regarding the glitter nail polish, are we able to pick out the glitter pieces from the polish and use them in the design? Man! All these good questions. You guys are clever! Yep, you can go ahead and do that. I hadn't thought of it, but I suppose it counts. Hmmm, two bottles? Sounds like a fun challenge. Who know, maybe I'll try my hand at it! Do you have to be a certain age to enter the competition? The prize is a gift certificate to an online store, so if you will be able to use that, you may enter. Would a mattifying top coat be counted as a clear top coat? Can we do toenails instead of fingernails or does the design have to be on our hands? Let's keep it to fingernails. After all, it is a "challenge". Good luck! No no, I appreciate you pointing those out. They were definitely confusing. I've fixed them to read more clearly. And to clarify, you may not use nail art decorations or stamps. Happy Blog Birthday! I am definitely creating something for this contest, it looks like a lot of fun! I had just entered my post! My blog is originally in Portuguese but all my posts are bilingual! I used two bottles of pink from China Glaze and did the art on my own nails! I combined the pleasant with the useful by also making it a October Pink post! Hope you like it! Submitted mine! Loving checking out all the blogs of other entries... Allison's glitter one is amazing! I used Ulta Sun of a gun and Ulta Blue Streak, don't care to support my blog, but can i just say....Thunder Up!!! Can you have rhinestones on your nails? Or does that disqualify you? Sorry, no rhinestones. That would count as a nail decoration. That's what I thought but I wanted to check! Thanks!!! Can more than one design be submitted? Or is it strictly one idea per person? Please just submit one design per person. Oh, for some reason my submission link is not working! How do I fix it? I tried linking it to my Pinterest, as I do not have a blog. My submission is the one with the name Angie F.
You don't need a blog. Try Flickr. The link you're currently using doesn't give information about which polishes you used. Hi! I'm super excited about this challenge. I was wondering if it was possible to use both the mattifying topcoat and clear topcoat or would the mattifying topcoat count in the two polishes? Matte topcoats and glossy topcoats do not count as bottles. She's only referring to coloured bottles. Base coats are not counted as well. Good question! You can definitely get creative with both matte and shiny top coats if you'd like. However, they must both be clear (no sparkle, shimmer or glitter) if you decide to use them. How will you choose the winner? Randomly, or your favourite look? Thanks for the contest! She'd pick the one she liked best. I am totally entering happy blog birthday! 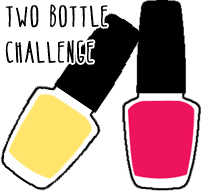 Im excited for this contest just because theres so much you can do with even just two polishes. Do i have to tell the colors I've used? Yes you do. So I can ensure you actually only used two bottles. I've used: Manhattan Lotus Effect 21G and Astor Quick ‘n Go 361 both brands are sold in Germany. I've used a thin brush to apply the polish. That's how i made the tiny lines. Happy birthday to your blog and congratulations to you. Thank you so much for hosting a nail art challenge. I love getting a look at all the manicures and there sure are some beautiful ones here! You're not allowed to use loose glitter, unless it came in a bottle of polish. Loose glitter counts as a nail art decoration, which is not allowed. I dnt know how to submit an entry.it says I have to have a URL..but I dnt know how to do that.can I just submit to your facebook or something?I've never done anything like this before. I posted my link,the colors are red:cherries in the snow white:hard to get. I dnt know if I did it right.I couldn't figure out how to use the inlinkz link..hope my entry is counted!